The "IT" Chambray Dress of the Moment (Look 6). 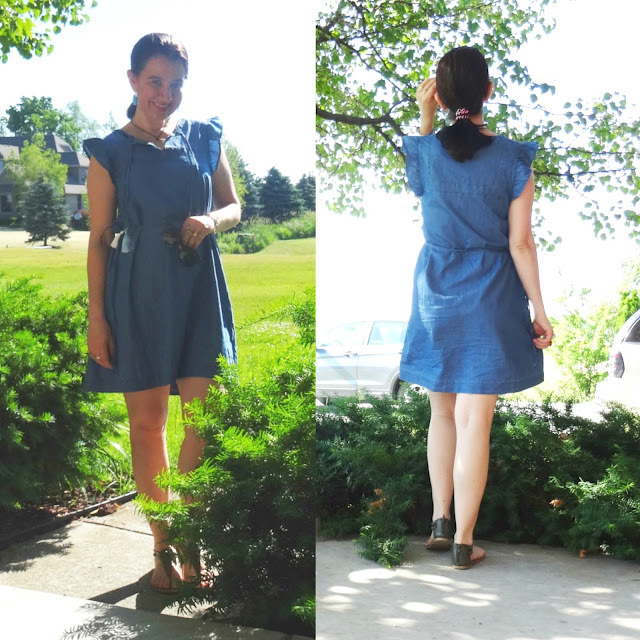 This is the IT Chambray Dress of the moment, you can purchase it here for a great deal. 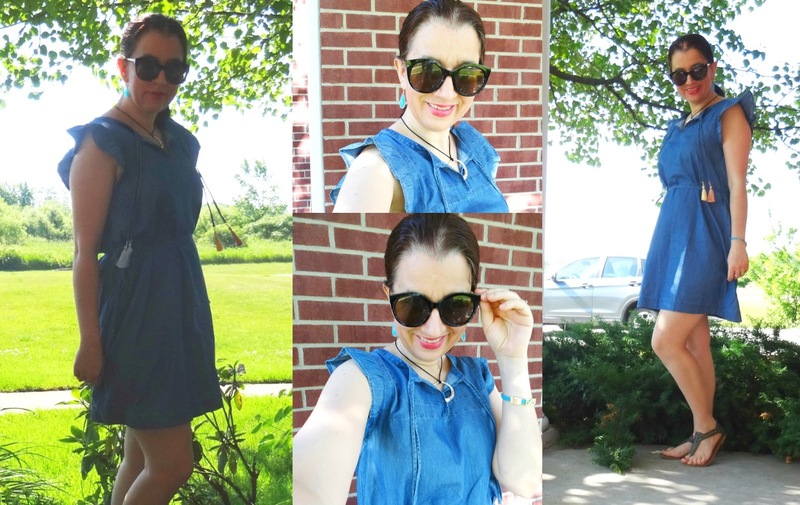 I say "the IT chambray dress" because not only is it pretty, versatile, flattering and perfect for all body types, but just last week alone I saw this dress on 3 blogs, 4 Instagram accounts and on 2 real life women. Which is a good thing, because it means I have good taste in good company. Yes, Loft strikes again guys and that is why it is currently my most favorite store. What makes this dress so perfect is the light chambray used made of 100% cotton, the length which is great because it is above the knees but not too short and it has cute and girly flutter sleeves - which we have seen incorporated on a lot of blouses too, this season from Loft. I for sure wanted to include a chambray dress in my 30 remix pieces for Summer (my capsule wardrobe I am doing currently) and though I own several chambray/denim dresses I decided to stick with this one because I love it. For the first time on this capsule and my first time wearing it, I dressed casually (just yesterday) with some Olive Faux Leather Thing Sandals from Old Navy I have had for many years, some cute Teardrop-Shaped Turquoise Earrings (recent, also from Loft - here on sale), my Dark Gray Marble Sunnies and a little Turquoise Bracelet. My hair is getting longer and since it was about 85 degrees I put it on a ponytail using a Cute White+Pink Plastic Spring Elastic which can double as a bracelet. I am determined to dress up this chambray dress with tasseled laces, for a date night or a girls night out type of evening so stay tuned for that, coming soon. Do you happen to own or plan to buy this lovely dress?! How are you going to style it? I love that each tassel on the laces of this dress is a different color, yet all in pastel shades: on the right side we have a silver and a sky blue tassel and on the left side we have a mellow yellow and a peach tassel. Silver Circle Pendant Necklace in Black Silk String: White House Black Market (similar, Huge Steal),(quite similar), (similar angled option, on Sale, Steal, love this), (silver+black pave option, Small Splurge, my Favorite). Pink+White Plastic Spring Ponytail Holder/Bracelet: Meijer's. All Day Redish-Pink Lipstick: "Rosa Rosa" by Estee Lauder (identical, Great Deal, I love it), (similar, Steal), (similar, Splurge). Olive Green Faux Thong Sandals: Old Navy (Old) (similar flip-flops, Steal, love these), (similar slides, love these), (similar braided style, on Huge Sale, my Favorite), (similar suede sandals, Great Deal, love these). Today, I shared one of the dresses I included in my 30 pieces for my Summer capsule. I am finally showing you some of the pieces from this capsule starting off with dresses. 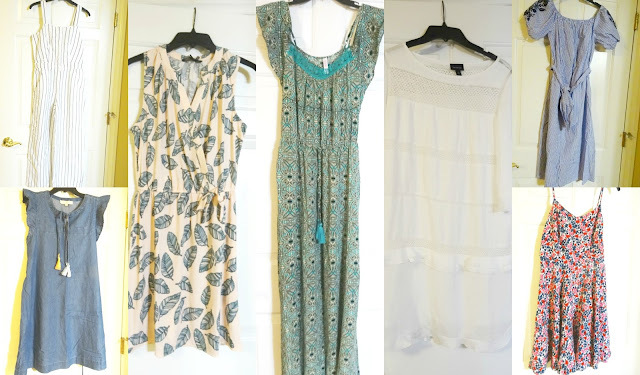 So below are all 7 one-piece items: 6 dresses and one jumpsuit - which you already saw and loved on my post the other day. One of the dresses is a maxi which I already wore once. Thank you for making it this far into this post. 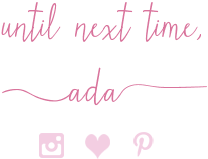 The other day I shared a heartfelt post about my father that I'd love for you to read. Thank you.